when you spend £45 on REN! Beautifully packaged, REN's gorgeous gift sets are as lust-worthy as the skincare favourites they house. With an array of perfect presents and 'treat yourself' duos from the go to brand for beauty editors around the world, you're sure to find what you're looking for with our carefully curated collection of REN gift sets and kits. A handpicked selection of REN’s bestsellers. Designed to soothe, nourish and treat skin, revealing your inner radiance. Re-balance body and mind with the uplifting scent of kelp and magnesium that will help ease stress and calm your mood. Formulated with one of the world’s most expensive, luxurious, and sought-after essential oils. REN’s Moroccan Rose Otto range is nourishing, relaxing and deliciously indulgent. A brightening skin treatment to energise smooth away imperfections and signs of fatigue. REN’s range of anti-ageing skincare marries the latest bioactive technology. With the cleanest of ingredients to address concerns such as a lack of firmness, deep-set wrinkles and hyperpigmentation for a plumped, refreshed and youthful looking complexion. REN’s Radiance Range are cult favourites for good reason. Formulated with bioactive technology and the cleanest ingredients, the products are designed to reveal a renewed, revived and radiant complexion. REN’s Rosa Centifolia range comprises gentle yet effective cleansers. Built around a completely natural, clean Rose Extract Complex. Skin is toned, softened and soothed. Nourish, hydrate and soothe your skin with REN’s range of super-powered moisturisers. A blend of high-tech bio-active ingredients and the most advanced skincare technology on the market. REN’s Vita Mineral range focuses on hydrating, nourishing and replenishing the skin. With a constant source of beneficial natural actives and biotechnology. REN’s bestselling sensitive skincare line. Evercalm steers clear of common allergens and potentially irritating ingredients to deeply care for your skin, whilst protecting it from everyday stressors such as pollution and free radicals. REN’s Clarimatte range encourages oily and combination skin to rebalance itself. With a combination of high-powered natural actives and clean biotechnology, avoiding the ‘strip-oil’ attack that can cause combination skin to go between extremes. REN’s Anti-Blemish range targets excess sebum production. Bacterial concerns, hormonal imbalances and spots. Treating skin with kind natural actives and combating the 3 key causes of breakouts and blemishes, leaving skin clear, calm and beautifully healthy. REN’s V-Cense range is ideal for thirty-something skin. As the first signs of ageing can appear, and urban life can exhaust our complexions. V-Cense banishes ‘urban grey’ and helps skin combat fatigue and the early signs of ageing. A refined but highly effective duo. Designed to give men the cleanest, smoothest, closest shave possible. REN’s delectable range of body products harnesses the most advanced natural skincare technology. From nourishing, exfoliating body balms to hydrating creams, achieve your skin’s perfect balance with REN. 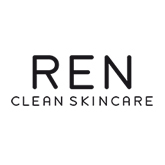 View all REN skincare products in one place. Not sure what you are looking for? Simply select your skin type and product type. REN (meaning CLEAN in Swedish!) was founded in 2000 in the UK. REN quickly became the go to brand for beauty editors and consumers around the world and can now be found in over 50 countries. REN’s approach is to make CLEAN products; products that are not only effective and address specific skin concerns, but are also a delight to use and pleasurable for the senses. Most importantly REN ensure that their products are free form any unnecessary synthetic ingredients that have the potential to irritate the skin. Performance - REN use cutting edge biotechnology with highly active ingredients to create outstanding products that boast impressive clinical results. REN’s Anti Ageing range perfectly illustrates their innovative formulas. Purity – REN don’t believe in using any synthetics or “nasties” in their formulations. REN use only 100% plant and minerals derived actives. REN products are free from synthetic colours and fragrances, sulfate detergents, Parabens, aluminium as well as many other potential irritants. Pleasure – REN creates beautifully textured products that are scented only with natural ingredients. Their Moroccan Rose Body Range has won multiply industry awards for a reason! REN believe that through the experiences of using their products, you day will be just a little be brighter. REN is a firm favourite here at Gorgeous Shop. The packaging is colour coded to easily choose the range perfect for your skincare concern. Whether that is the top selling Evercalm Range, perfect for delicate and sensitive skin, the amazing Bio Retiniod Cream from Ren’s Anti Ageing range or the Radiance range with REN’s award winning Glyco Lactic Radiance Mask. At Gorgeous, we are in love with Flash Rinse 1 Minute facial, your complexion really does go from grey to Wahey in just 60 seconds! Why not treat yourself or a friend to one of REN’s gift sets?